The Anza group at the University of California San Diego operates a broadband seismograph network consisting of 16 (+ 2) three component broadband seismograph stations centered near Anza California (see map). We are also partners in a 10 station broadband network, KNET, that spans the Kazakstan/Kyrgyzstan border in Central Asia. 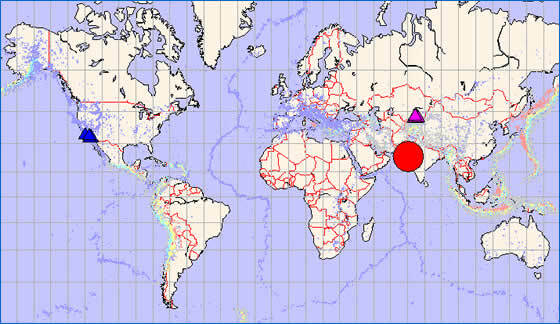 At approximatelely 19:16 PST (1/25/2001) a large (7.9 mb) earthquake occurred in India near the border with Pakistan. Severe damage and many casualites have resulted from this earthquake. The epicentral distance (distance separating the epicenter and the recording network) for KNET is ~19.5 degrees (2168 km). For ANZA the distance is ~122.7 degrees (13643 km). This quake is considered to be a "teleseismic" event based on the epicentral distance from the ANZA network. This map shows the mainshock (red circle). Anza network stations are dark blue triangles. KNET network stations are pink triangles. Background seismicity is plotted in light dots with warmer colors representing deep earthquakes. An external site (IRIS-DMC) also has a page with more information about this event. Read a brief description of the geology of the area. Learn more about the Anza group (including who works here, station information, research, other networks, nuclear tests in China/ India/ Pakistan). If you are interested in retrieving data for this event, please visit the IRIS-DMC for data access.